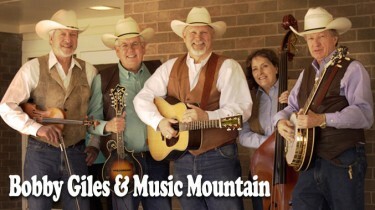 Bobby Giles and Music Mountain is a Texas-based bluegrass band, featuring original songs and exuberant performances. The winners of both the prestigious Bluegrass Heritage Foundation 2015 Front Porch Showdown Bluegrass Band Contest as well as Texas Bluegrass Music’s 2015 Battle of the Bands, they are also recent inductees into the Gatesville Country Music Hall of Fame. The band is currently touring in support of its new CD Story of Love. Becky McGaughy plays the upright acoustic bass and sings high harmony. The proverbial “bluegrass widow” who decided to pick up the bass to spend time with her husband, keeps a rock-solid beat. Tim McGaughy plays mandolin, sings middle harmony and brings a selfless humor and a unique interpretation of ascending fifths to the band. Dave Kuncicky loves playing the fiddle and delivers precise, pure and intentional musical elements to Music Mountain’s songs. Steve Loggie, the purveyor extraordinaire of the 5-string banjo, brings years of experience and impassioned, intricate musical detail to the band. Bobby Giles is a passionate, award-winning songwriter who sings lead vocals and plays the flat-pick guitar.